O2 Derm Relief is a simple, pure gel that is abundantly rich in molecular oxygen. Molecular Oxygen is known to promote healing and contribute to muscle ache relief. The story of O2 Derm Relief and Derm Creations is not the tale of a large cosmetic or pharmaceutical company manufacturing a new chemical product. Instead, the history of the gel that takes oxygenation to a new level began in the small Pennsylvania town of Verona, near Pittsburgh. Dr. C. E. Eckert is an accomplished chemical engineer with a history of many patents and innovations in metal treatment technologies. His interests also extend to Aqueous Oxygen Systems and the benefits of the dermal absorption of oxygen. Working in conjunction with Derm Creations, LLC Laboratories, Dr. Eckert was able to formulate a gel with almost 20 times the oxygen level found in ordinary water, creating a stable oxygen suspension within a solution. When rubbed in, it offers a rich source of molecular oxygen for cellular and soft-tissue uptake. Initially conceived as a skin-enhancing cosmetic, anecdotal evidence from O2 Derm™ users quickly began to mount. Testimonials not only confirmed that we were on the right track, but helped to guide development of the O2 Derm™ product line. And the adventure continues. New effects and uses continue to be reported. For example, people have found that rubbing O2 Derm™ gel on your hands before performing dirty or greasy work helps you clean up later with less scrubbing and use of soap! 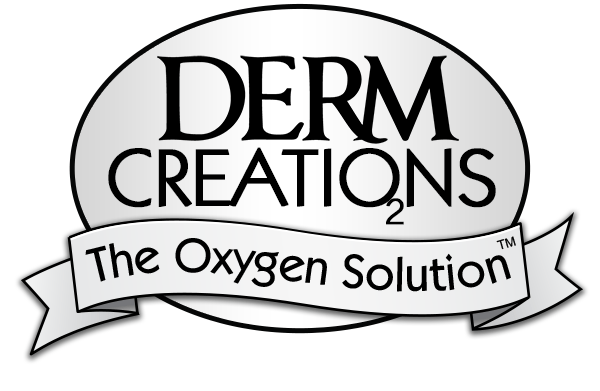 To keep up with the latest on Derm Creations and our products, visit our O2 Observations blog.